Hey friends! Double post today because time is of the essence. I popped in to Vineyard Vines two weeks ago to grab a few pieces for my trip to India. (Nothing like realizing ALL of your spring/summer clothing is still in your hometown two days before a warm-weather trip. VV to the rescue, their store on Rush Street is just around the corner from my apartment!) I was just scanning my email and realized that their Friends & Family 25% off sale is going on and ends tomorrow — Wednesday, March 20th! Use code FRIENDS19 for 25% off! 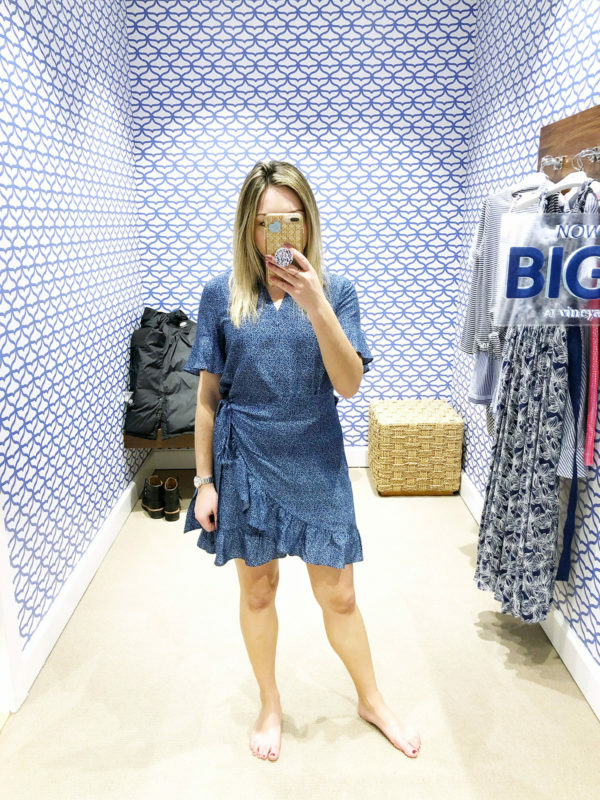 I figured I’d share what I tried on, loved, and took home in case you want to place an order before these pieces make it on to the blog in outfit post form. Plus, a little sale shopping is the perfect way to start spring off on the right foot! If you buy one thing, it has to be these seersucker pants. If you know me at all, you know that I HATE PANTS. I would have never picked these off the rack, but the sales associate brought them in for me to try and I figured I’d humor her to try them on. COULDN’T BE MORE OBSESSED. They’re high-waisted, wide-legged, and slightly cropped. They are SO flattering, too! (I feel like I need to go back and try on this white pair, too!) Wearing a 4. You can’t see it in this photo, because I have it rolled up and tucked in to show off the pants, but I also got this black scalloped tank top. It’s slightly boxy and so perfect with white jeans! Such a great top to wear to work under a blazer, and out for dinner or drinks, too. Wearing a 4. 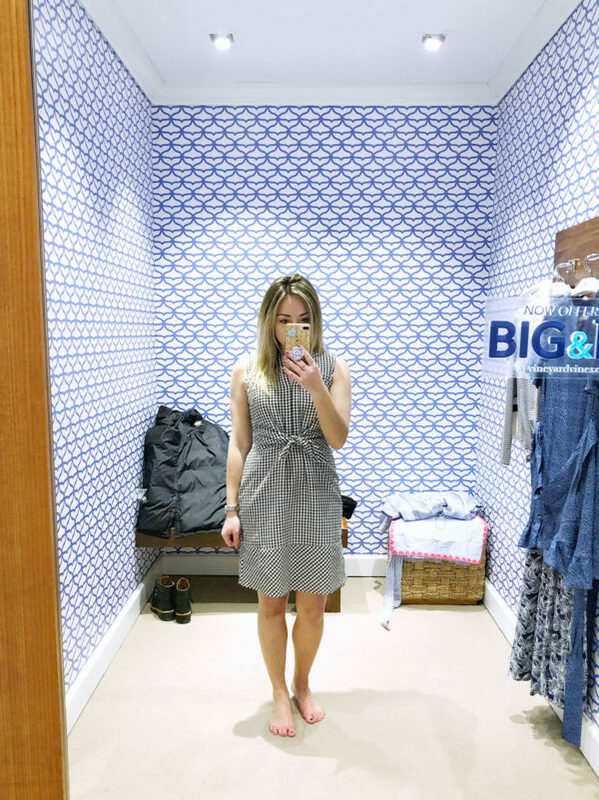 My second must-have: this seersucker wrap dress!!! This would have been my #1 must-have on this list, but I didn’t actually take this home with me and felt like that was important to distinguish. It was my favorite piece that I tried on, but since I was only getting things to wear in India, I didn’t get this dress as I was worried it would be too short in regards to cultural appropriateness. 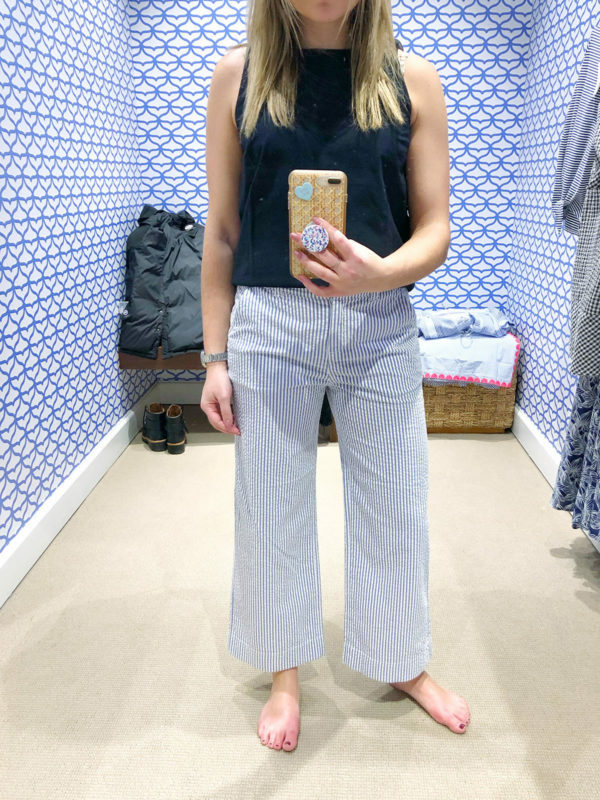 It’s really not *that* short, it’s so, so perfect for spring and summer. It’s #1 on my wish list right now, that’s for sure!! Wearing a 4. I love the longer hem line on this black and white gingham seersucker dress, as it makes it appropriate for just about every single occasion… Add a cropped jacket for work, add a heel and wrap for church, add a pair of lace-up sandals for a picnic, wear it with sneakers on the weekend… Options are endless! The tie-front gives such a nice shape and takes all of the guesswork out of getting ready because you don’t have to worry about adding a belt. Wearing a 4. 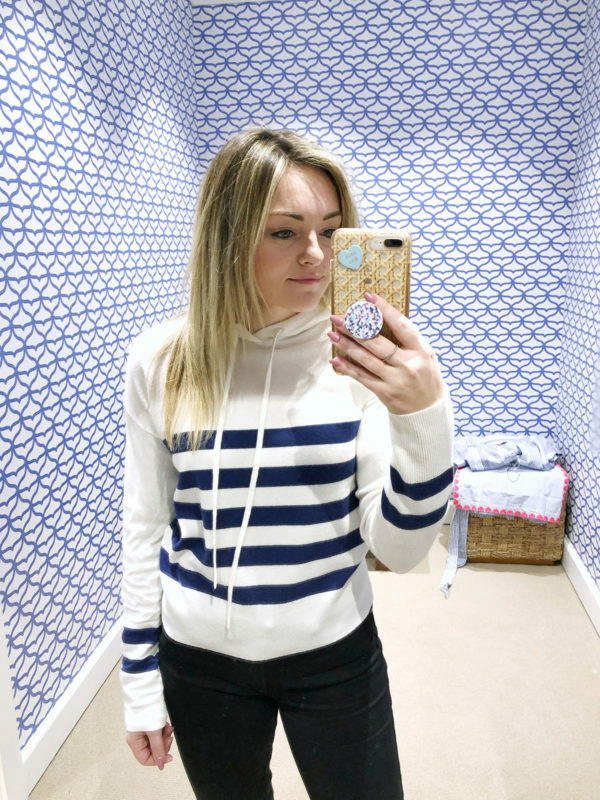 I loooooved this striped hoodie! It was the softest material that felt like 100% cashmere, even though it’s only 10%. But again, I was only shopping for India so I didn’t take this home with me. Yet another item on my wish list! It also comes in this gorgeous camel color. Dare I say we all need them both?! haha Wearing a small. 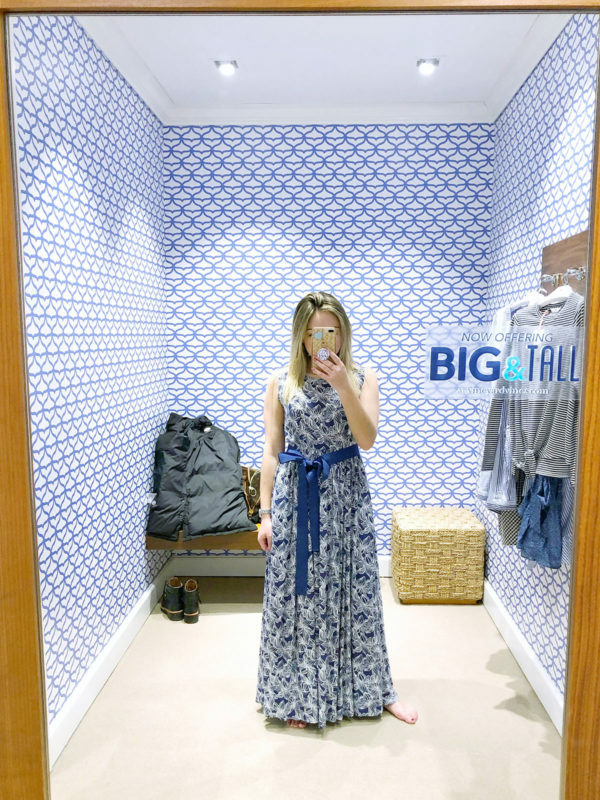 This maxi dress is so pretty, especially in person! I love the flattering cut at the shoulders and the oversized grosgrain ribbon tie at the waist. I have a feeling I’ll be living in this all summer long. Wearing a 4. And last, but not least, this fun wrap dress! I had it styled with the tie at the side (and that’s the way I wore it in India, too! ), but now that I’m seeing it online with the model, they have it tied in the back, which probably makes more sense from a fit perspective! But hey, I won’t complain about having two ways to wear the same piece. Wearing a 4. 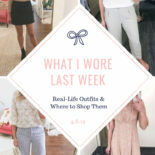 Here are a few other favorites online that I’m loving for the next few months! Literally swooning over these dresses! You look so cute but I especially love the wrap dresses. 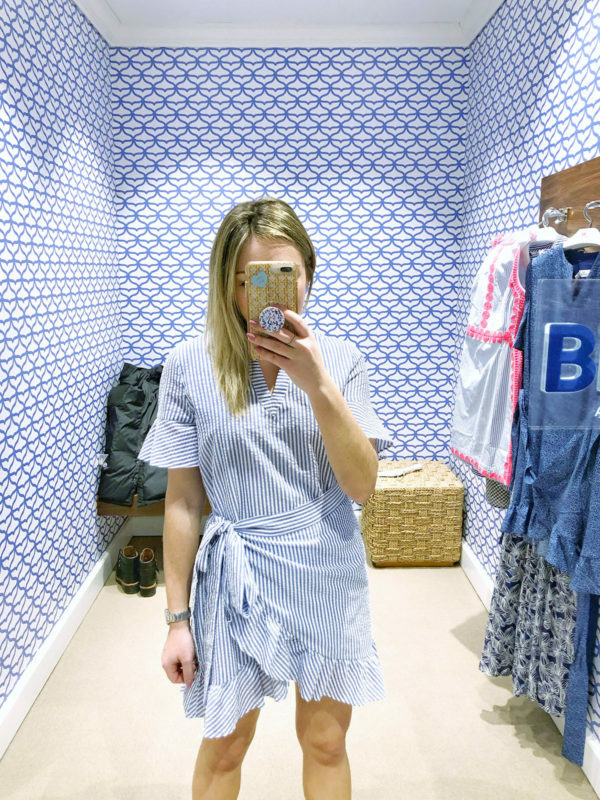 The wrap dresses are amazing, aren’t they?! So flattering! I love the printed one I got, but the more I look at the seersucker one, the more I think I’m going to pop back in to the store this afternoon and get it, haha. 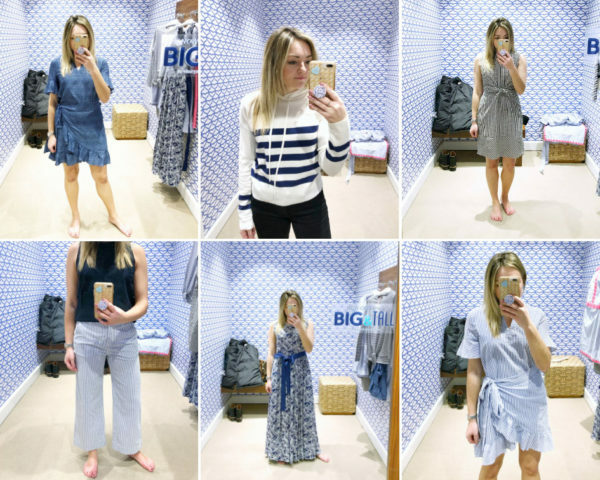 All the looks are darling – I love them all. But I also love your wicker caning phone case….where on earth did you find it? Love! I also just found it new on eBay for a little bit cheaper, too! I’ve had countless Sonix iPhone cases over the years and they’re SUPER protective against drops, highly recommend! Thanks so much! It’s adorable!! You tried on beautiful pieces! Love the stripes & wraps! You wear blue so well! Good picks!